As well as the iPhone 8 and iPhone 8 Plus Apple is also launching a third iPhone in 2017 - the iPhone X release date is 3 November. 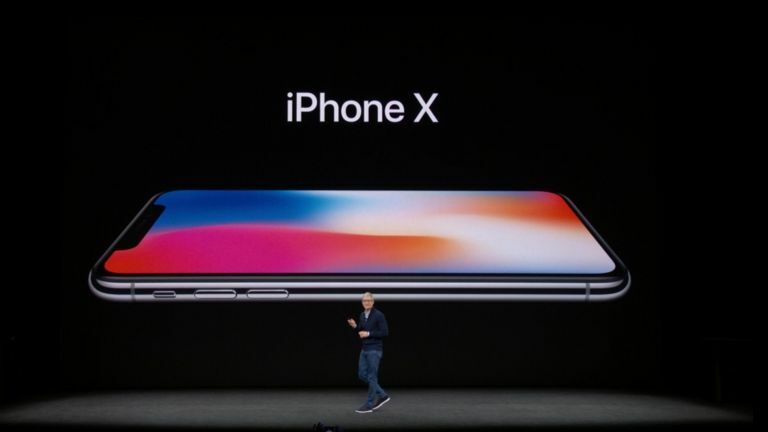 The iPhone X features include a full-glass front, OLED display, powerful facial recognition system and new dual camera with True Tone and optical image stabilisation on both cameras like the Galaxy Note 8. In short, it's an epic iPhone - celebrating a whole decade of iPhone but also introducing a bunch of state-of-the-art specs to match (or better) the efforts of Apple's rivals. Made of 'the most durable glass ever' it has a surgical steel (like a premium watch) band wrapped around it and comes in Space Grey or Silver. No jet black this time around - probably because it was prone to scratches. The 5.8-inch iPhone X display is phenomenal, with 448 pixels per inch and a 2,436 x 1,125 resolution. It's got HDR10 and Dolby Vision support and features Apple's True Tone tech. And yes, it's OLED this time. The processor is Apple's new A11 Bionic chip, just like in the iPhone 8. It's available in 64 or 256GB versions. Despite the new display, there's also two hours more of battery life versus iPhone 7. There's also wireless charging just like the iPhone 8 via the Qi standard - Apple has a new AirPower charging mat that you can also charge your Apple Watch Series 3 on. That's coming next year in addition to a wireless charging case for the AirPods. The iPhone X release date is Friday 22 September. All the new iPhones will be waterproof and dustproof. The iPhone X is from £999/$999 USD for 64GB so the 256GB iPhone X will be VERY expensive. Face ID has been introduced, so you can now use it instead of Touch ID (we currently don't know if we will have Touch ID as well but we assume not as there is NO HOME BUTTON). It's a two camera system and you can use it for Apple Pay as well as unlocking your phone. It's been specifically designed so you can't erroneously unlock - you have to be actively looking at the phone. It can recognise your face even if you wear a big hat, and will discount someone wearing makeup to resemble your face. According to Apple, only one in a million people could unlock your iPhone X with their face, compared to one in 50,000 who might try to unlock your phone using a fingerprint, via Touch ID. We're really intrigued to find out how Face ID works in practice. Touch ID is so easy, so will it really be a worthy replacement? With the home button gone, you can now swipe up from the bottom to multi-task or activate Siri vocally or via a 'larger side button'. Both the front and rear cameras have portrait mode. According to Jony Ive, the rear dual-camera setup has been completely redesigned and there's now a Quad LED True Tone flash. The 'True Depth' camera array features dual 12MP sensors, with f1.8 and f2.4 (wide angle) apertures. It seems very advanced, yet is mainly utilised in this presentation at least, for quite stupid things, such as tracking your face in order to animate an emoji. Woo! But crucially both of the cameras have optical image stabilisation (OIS) like the Galaxy Note 8. This means that taking really zoomed in shots will be a lot smoother. Apple also released plenty of other new software and hardware. There will be iOS 11 soon of course, which will be in all the new iPhones including the refreshed iPhone 8. There is a new Apple Watch 3, in addition to watch OS 4. There's also been an Apple TV 4K. There are no more details on an Apple HomePod release date as yet, or the new iMac Pro coming this year and Mac Pro that's slated for 2018. The macOS High Sierra release date is 25 September. As usual, we expected Apple to release an 'S' version of its existing handsets, so expect iPhone 7S and 7S Plus. But a rumour suggests that these will actually be called the iPhone 8 and 8 Plus instead. The new Apple iPhone X, which could also be called the iPhone Edition - will be released as a completely different third iPhone model. While the popular vote is for Apple to stick to numbering - in other words the new iPhone will be called iPhone 8 - we reckon that Apple will save that for next year. Instead, we reckon Apple might rename the most powerful iPhone yet something a little different. iPhone 10 seems unlikely, but what about iPhone X or iPhone Edition? We like the sound of that. The latest rumours are definitely pointing towards the iPhone X as well as an iPhone 8 and 8 Plus. That's after 9to5Mac talked to case manufacturers out at IFA 2017. The final version of iOS 11 leaked over the weekend, which seems to confirm the iPhone X name. Some of them are actively altering their case packaging to reflect the new iPhone names and others claim to have contacts who have seen the new iPhone Edition packaging. When is the new iPhone release date? Apple has confirmed the new iPhone announcement for 12 September. Looking at it logically in comparison to previous iPhone launches, that would probably mean a release date on Friday 22 September or Friday 29 September. However, there is a scenario where the iPhone 7S and 7S Plus (which may now be called the 8 and 8 Plus) will be released in September, with the iPhone 8 or iPhone X release date later on, probably during October. We'd have thought this is unlikely - and that's what we're hearing from several sources - but it is possible, and there are continued rumblings about this. We're also expecting Apple to release some other new software and hardware. There will be iOS 11, of course, which will be in all the new iPhones. There will be a new Apple Watch 3 possibly, in addition to watch OS 4. We may also get some more details on the Apple HomePod release date, as well as the new iMac Pro and Mac Pro that's slated for 2018. And there will also be an announced macOS High Sierra release date. The first time we looked at iPhone 8 rumors back in April, the source was designer Benjamin Geskin, who has been reliable in the past. He claimed to have a CNC machined model of the phone along with plenty of details. As you can see from this picture the handset looks similar to the current iPhone 7 in shape and size. Geskin says it’s about the same thickness at around 7.1mm but it’s that front where the major changes can be found. One image here has been doctored to show what the final model will look like with the screen on. Geskin claimed that means a near edge-to-edge screen with 4mm bezel and curved 2.5D glass on both the front and back. Geskin said that iPhone 8 would feature a Touch ID fingerprint readerbehind the glass. There are also dual rear cameras - vertically arranged - and even dual front cameras (we think this is unlikely in the final iPhone X or 8). Could it be called the iPhone 'Edition'? Or iPhone Decade Edition? According to Bloomberg - again from April 2017 - the new handset will be called the iPhone Edition. It reiterated the previous Geskin rumours that there would be an “all-screen” front encased in glass and a steel frame. That screen should be OLED and be surrounded by more dynamic curves, like the original iPhone. The report also says the iPhone Edition will feature more advanced cameras. As we said, lots of leaks point towards an iSight Duo dual camera system with up-and-under layout. Some rumours around this time suggested supply chain issues with the OLED screen, though we'd have thought this unlikely. Actually, could there be dual cameras on the front of the iPhone 8 or iPhone X? A leaked image showed a dummy iPhone 8 in a phone case but, crucially, we get a good look at both sides so can see the screen and dual cameras. In typical Apple style we don’t just have a dual camera setup, it’s a badass one-piece tinted glass finish. Of course this could just be the dummy model with stand out separate lenses on the final model but what it does show is a clear up and under dual camera setup. On the front we can see the screen runs right to the edges of the handset with no home button in sight. Even the top camera and sensor appear to be hidden behind that single front glass piece. Also leaked at the same time are some CAD images that leakster Ben Geskin claims show off what we can expect. He also says that we should be getting wireless charging that runs through the back of the entire phone. That circle on the back, he points out, is for the Apple logo. Some suggested this was a fingerprint reader on the rear, but we'd have thought that very unlikely. And yes, could that really be dual front AND rear cameras? A few weeks after Apple's WWDC developer confeerence, it was revealed in July that Apple had written about the iPhone 8 in some software that lives inside the forthcoming HomePod speaker. Developer Steve Troughton-Smith found the hidden information about iPhone 8 in relation to the HomePod. There was a diagram which shows off an iPhone that is, as rumours have suggested, bezel-free. Of course this is a basic design image so could have simply left off some details like the front facing camera and speakers, which are expected to be hidden in the iPhone 8. This, according to the leak, will use infrared to detect the face of the phone’s owner - perfect for in the dark. That can then be used to also unlock the HomePod. And what's this? A new brand new iPhone 8 colour has appeared. According to Benjamin Geskin, this leak appeared right out of Foxconn itself (Foxconn is Apple's assembly partner for the iPhone) and is the official name there for the new colour. Apparently the appearance of Blush Gold means that Rose Gold is no more. Maybe that;s copper-like Blush Gold. It seems Rose Gold will allegedly get discontinued at the iPhone 8 launch in favour of the new colour on the scene. The new iPhone also has two memory sizes according to this leak - 64GB and 128GB. As the iPhone 8 will be a premium handset that's more expensive than the iPhone 7S, we can well believe this. However, we'd expect 256GB as well. Images also leaked in July showing off the Blush Gold model stood alongside shiny black and pearl finish iPhone 8 handsets. Apple looks set to bring facial recognition into the mainstream. Specifically it looks like the iPhone 8 might use facial recognition for unlock and Apple Pay. We're not sure about that last bit, since facial recognition can be faked sometimes. The only way we can imagine it working is in tandem with a fingerprint. Once again that HomePod code is the source. According to developer Guilherme Rambo the facial recognition code, dubbed Pearl ID by Apple, should work with third party apps and multiple faces plus it will support payments. It sounds like Apple may employ facial recognition in combination with fingerprint reading for a two-step verification, making Apple Pay super secure. But there’s more. The HomePod code also revealed that the virtual home button can be re-sized, the rear camera will shoot at 240fps slow-mo with 1080p quality and it will record HDR. One odd reference in the code suggests both the front and rear cameras are needed for facial recognition. How that will work is unclear. Of course these are all code discoveries that could be preparation for a later iPhone, but it seems likely we can expect the updates in the iPhone 8. According to leaks from Apple suppliers in June we should be able to expect waterproofing and - at last - wireless charging in the new high-end iPhone. Wireless charging would definitely distinguish the iPhone X from the iPhone 7S. The CEO of Wistron told Nikkei Asian Review: “Assembly process for the previous generations of [iPhones] have not changed much, though new features like waterproofing and wireless charging now require some different testing, and the waterproof function will alter the assembly process a bit.” Wistron manages some iPhone manufacturing in India. Of course there is a small hole in that quote, the iPhone name. So we need to take this one with a pinch of salt. Will there be a mirrored finish as well? The new iPhone 8 is leaking more and now a new colour has slipped out that offers a “mirror-like” finish. According to Apple leak specialist Benjamin Geskin we can expect four colours for the iPhone 8 with the mirror finish as a new option - this is according to an unnamed souce. The images Geskin shared are just of a phone case but give an idea of what we could expect. Since the iPhone 8 is widely leaked to be an all glass design this mirror finish could work really nicely. Especially for those that like to give themselves a quick glance without firing up the selfie snapper. Of course we have to take this with a pinch of salt as it’s from an unnamed source. That person could be mistaking “mirror-like” for the jet black model with is highly reflective finish. Did McDonald's give the game away? A new promotion has gone out over email in Australia promoting McDonald’s with what appears to be an unofficial iPhone 8 render. What’s clear is that while this might look like the iPhone 8 we expect to see, it’s nothing official. In fact it seems that McDonald’s has got access to someone’s mock-up and used it in this promotion - probably to get new coverage just like this. Of course there is the chance that the renders so far got lucky and this is bang on what we can expect. Rumours have strongly pointed towards a new screen that runs the front of the phone with minimal bezel. The only break appears to be for the speaker, sensors and front facing dual cameras. According to sources of Japan’s Macotakara the next iPhone 8, iPhone 7s and iPhone 7s Plus will all have wireless charging built-in, just like Apple Watch. However, these charging abilities may be limited to 7.5W as opposed to the maximum of 15W that the Q1 wireless charging standard allows. This comes from a source within the Wireless Power Consortium, suggesting they know what they’re talking about. So why be limited to 7.5W? The current Apple Watch tops out at 7.5W, suggesting that Apple may want the iPhone 8 to be on the same charging format. That could be to allow for multiple device charging pads. But it will be SLOW. So you could have a pad by your bed which you throw your iPhone and Watch on at night before sleep and have them both charge overnight. Since this is a long overnight charge the low output won’t really matter anyway. If you want a faster charge just plug it in, right? Could iPhone 8 stock be limited? If you’re one of those Apple fans that simply MUST have your new iPhone on launch day, this year could be a challenge. Apple is apparently going to have limited numbers of the iPhone 8, thanks to embedding an optical fingerprint reader into the OLED screen. Samsung also, allegedly, wanted to put a fingerprint reader in the screen on its Galaxy S8 but had to bow out and place it on the rear. Mind you, the new Note 8 sticks with the rear-mounting. The silver lining to this cloud is that the new iPhone 7S and iPhone 7S Plus models, which use the usual LCD displays, shouldn’t be affected by this problem or be short in number. Of course, if you’re an Apple fan, you’ll only want the best so you’ll need to dust off that tent and get ready for a long old queue outside your nearest Apple Store. A confirmation of what we've said already, this one. A leaked screen bracket, supposedly straight out of iPhone production HQ at Foxconn, shows off the new iPhone 8 front. On its own that looks pretty simple but compared to an iPhone 7 screen bracket we can see this is super minimal. The iPhone 8 screen appears to have no home button, no large top and bottom bezels and pretty minimal side edges too. The result should be nearly all screen on the front with no buttons and barely any camera or sensor space taken up. Was this the first real sighting of iPhone 8 or iPhone X? A video emerged in June that claimed to show off the iPhone 8. The video, shot by @ShaiMizrachi was shared by 9to5mac and claims to show off a dummy model of the iPhone 8. From the iPhone 8 hands-on time in the video we see it from every angle and it looks it matches up to rumours so far. There’s a metallic edging - like on the original iPhone - up and under dual rear cameras, no home button on the front and no fingerprint reader on the rear suggesting that in-glass fingerprint reader. The screen wasn’t turned on so how edge to edge that is was unclear. The bottom of the alleged iPhone 8 features dual drilled speakers and a single Lightning port - still no 3.5mm headphone port of course. When compared to an iPhone 7 Plus the width and depth doesn’t seem much different suggesting a similar screen ratio. This is claimed to be a 5.8-inch bezel-free OLED, also expected is wireless charging and augmented reality camera features. And read more about the new iPhone 8 at TechRadar.